After I told my friend Alex that I had been invited to take part in a competition hosted by Amarula, to celebrate South Africa’s heritage, he mentioned making a dish based on the springbokkie. This is a shooter made of Amarula and peppermint liqueur. The springbok is our national animal, and nothing says South Africa more than the term Bokke, which refers to our South African national rugby team. This venison casserole for can be enjoyed in any setting, for any occasion. I chose to make it for lunch last Saturday so we could eat it while watching the rugby – it was raining and cold outside and this was a warming meal. Disclosure: I was provided with a bottle of Amarula in order to enter this competition, and the prize for the winning dish is a luxury getaway in the Bushveld. This post is in line with my blogging policy. Definitely pinning this one for when the weather turns cool! I’ll muster up the courage to try this one, too good to resist! It’s a beautiful dish! Tell me what amarula might taste like? Best of luck to you in the competition. What a gorgeous dish! I hope you win this. You really should win with this one! 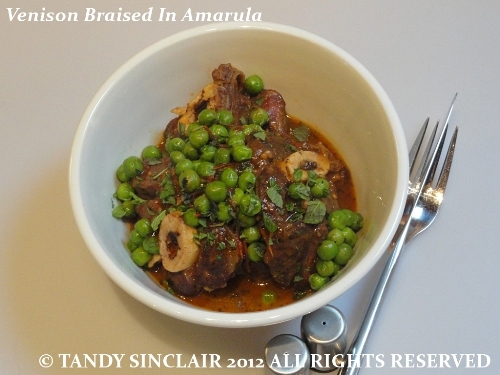 I think you are well on your way to winning with this recipe Tandy. I love venison but we can´t get it here. This dish sounds so good, so many lovely flavours and perfect for sitting and watching the rugby!